We now turn to helminth worms (Figure 5.13), which have the following key properties. First, the parasites generally have complex life cycles, possibly using many hosts or having a free-living stage. Figure 5.12. 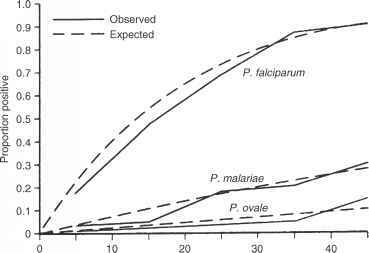 Comparison of the predicted and observed dynamics of malaria from Anderson and May (1991). Reprinted by permission. Second, the actual number of parasites that a host harbors, rather than just the state of the host (infected or not), is important. Third, the number of parasites is most commonly overdispersed. That is, let denote the worm burden carried by a host and think of it as a random variable. We know from Chapter 3 that if worms were randomly distributed across hosts would have a Poisson distribution in which the mean and variance were equal. However, empirical data (an excellent review is given by Shaw and Dobson (1995)) show quite the contrary: that typically the variance of the worm burden exceeds the mean. So, the negative binomial distribution - which helped stabilize host-parasitoid interactions - will have an important role to play here. In this section, I discuss three models of increasing complexity, each of which illustrates a different point and gives a sense of how we use the tools that have been developed. As before, I refer you to the original literature for more of the details. We begin with a classic model due to Roy Anderson and Robert May (Anderson and May 1978, May and Anderson 1978). These papers contain eight different models (a basic model and then seven elaborations of it) and total nearly 50 pages, so in this section I can introduce only the basic model and one of its elaborations. But this should be sufficient to send you on your way. Figure 5.13. (a) A female red grouse brooding chicks. Detailed field studies and experiments have shown that the parasites make their prey more vulnerable to predation (Hudson etal. 1992a, Packer etal. 2003). The parasites appear to interfere with the ability of females to control scent. (b) A young grouse chick infected with ticks Ixodes ricinus. These ticks can transmit the Louping ill virus that causes 80% mortality and reduces the growth rate of the grouse population (Hudson et al. 2002, Laurenson et al. 2003). 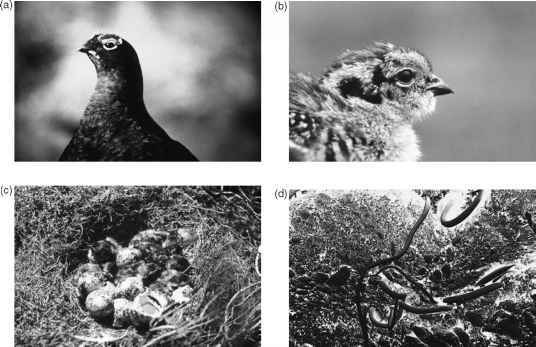 (c) Experimental reductions in the intensity of nematode infection have shown that parasite removal results in an increase in clutch size, hatching success and survival of grouse chicks (Hudson 1986, Hudson et al. 1998, 2002). (d) Nematode worms (Trichostrongylus tenuis) burrowing into the caecal wall of red grouse. These nematodes have a major impact on the fitness of individual hosts to the extent that they cause morbidity, reduced fecundity and generate population cycles (Hudson et al. 1998, Dobson and Hudson 1992, Hudson et al. 1992b, 1998). Photo compliments of Pete Hudson. Here, we consider parasites that do not reproduce within the host but which produce a transmission stage (eggs, spores, cysts) that passes out of the host before acquisition by the next host. To begin, we assume that the amount of time that the transmission stage is outside of hosts is very short (this assumption is relaxed in the next section). In that case, the dynamic variables are the population of hosts, H(t), and the population of parasites, P(t). These are treated as deterministic variables, so that the mean number of parasites per host is P(t)/H(t), even though the underlying distribution of worms per host is stochastic. Watch how this is done. Here I keep the notation used by Anderson and May, so that a and b are the parasite-independent per capita rates of host reproduction and mortality. These are clearly not the same a and b that we used in the previous section, and as I wrestled with presentation of these different models, I decided that keeping original notation of primary sources was better, and would also keep you on your intellectual toes. You will see momentarily why they are separated. 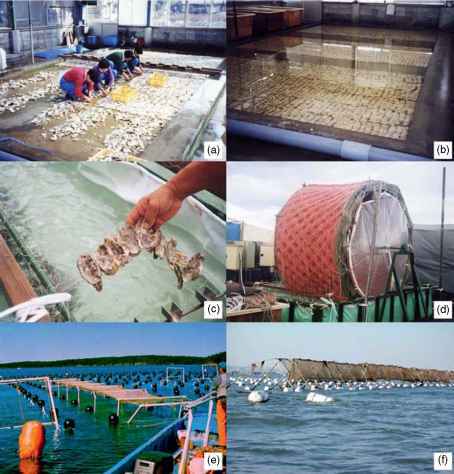 Parasite population growth involves production and transmission. At very high host densities, we assume that parasite production depends only upon the parasite per capita per host fecundity l, so that parasite production at high host density is !H(t)Sw=0wp(w) = 1P(t). We correct this at lower host densities by assuming a type II functional response and thus assume that the net rate at which parasites are acquired by hosts is lP(t)[H(t)/(Ho + H(t))].